Log into your Facebook account, then go to the page you would want to recommend that your friends “Like”. 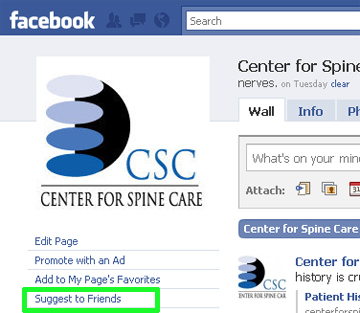 For Center for Spine Care, click here. Underneath the profile picture in the upper left hand corner, click on “Suggest to Friends”. In the pop up window, click on friends you would like to invite. You will see a check mark appear at the bottom of the friend’s photo if you’ve selected it. When you’ve checked everyone you want to invite, click “Send Invitations”. 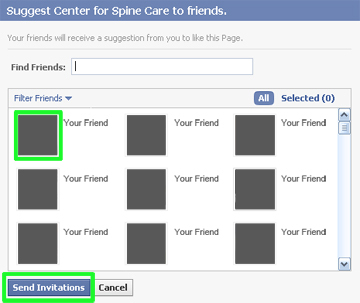 Your friends will have the chance to “confirm” or “ignore” the invitation.